Mr PC, in London, bought a 4kg UltraFire powder extinguisher from Safelincs back in 2011. 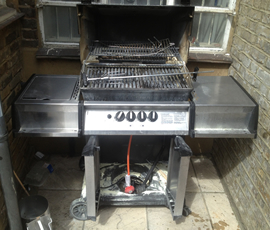 He contacted us again a few days ago to tell us how he had used the extinguisher to successfully put out a dangerous BBQ fire. As Safelincs offers free ‘after the fire replacement’ he, of course, asked for his free replacement extinguisher which we have sent him. This service, exclusive to Safelincs, ensures that our customers never hesitate to use their fire fighting equipment and that they are protected again as quickly as possible. Mr PC had started his almost new gas BBQ (it had only been used once before) at around 5pm and was entertaining his guests when later that night at around 11:30pm the flames of the fire went from ‘controlled’ to ‘uncontrolled’, as the fat at the base of the BBQ caught fire. The lid of the BBQ was immediately shut to starve the fire of oxygen, however, the opposite happened. Drawing air from the holes in the bottom of the BBQ the fire really heated up with flames licking out from underneath the lid. The gas was turned off but the fat fire still continued. Mr PC evacuated his guests, then fetched his 4kg powder extinguisher from his house and extinguished the fire. The heat of the fire had been so extensive that the mesh of the BBQ was deformed by the heat! So, while gas fired BBQs have the advantage of exact control of the heat while everything works as expected, it is still wise to position a gas BBQ away from the house, ensure that fat cannot build up and to have some form of fire fighting means ready.